This car really does need to be appreciated. Only 2 owners from new this is the 235i to own. Full BMW Service history and a service pack which includes its next service. 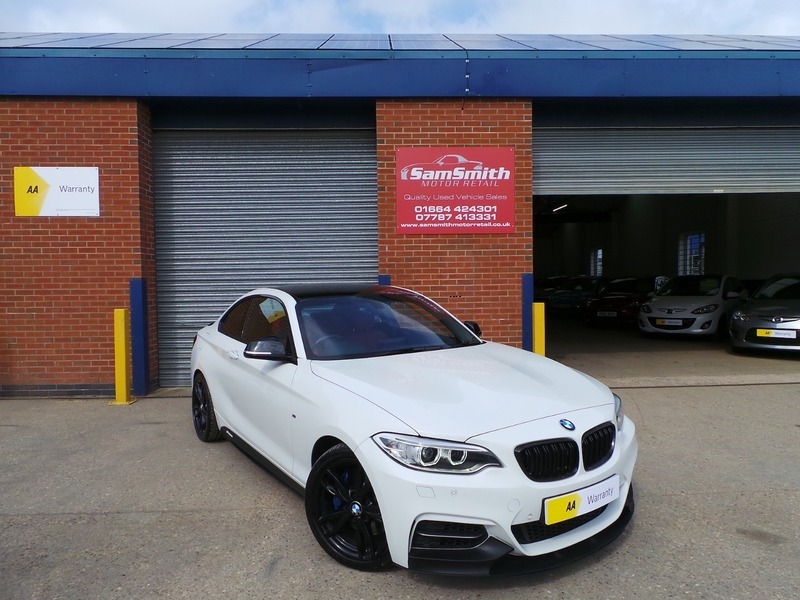 Full Genuine BMW M Performance Exhaust which transforms the car, it also has got the Full BMW Performance bodykit including M2 Kidney Grills. The car also benefits from the adaptive suspension which costs over £1000 from new, so this car not only looks the part but it handles much better than standard models also. Inside this car it only gets better, benefitting from the BMW Professional Navigation which includes Bluetooth phone prep and music streaming, Harmon Kardon upgraded sound system and immaculate full Red Dakota Leather Heated Seats. This car has got far too much spec to list, and everything about the car is fantastic. Don't miss the opportunity to own this one off car! Finance packages tailored to your needs, just ask one of our team to give you a quote. We offer hire purchase (HP) and PCP deals both at competitive rates. , Let us quote you for finance and value your part exchange not Autotrader or Zuto. We deal directly with the lenders to enable us to offer you the customer the most competitive rates of finance regardless of how much you borrow! All of our cars go through a very thorough workshop inspection, get freshly serviced if needed and come with a 3 month fully comprehensive (parts and labour) warranty and AA cover. Every car we sell is HPI clear with certificates to prove. LOW RATE FINANCE DEALS AVAILABLE. Open 5 days a week and weekends by appointment. Please call for availability & viewings.